Guiding my son, Peter, who hasn’t fly fished for a long time was FUN. The hard part was trying to figure out why we couldn’t connect to all the fish rising around us. 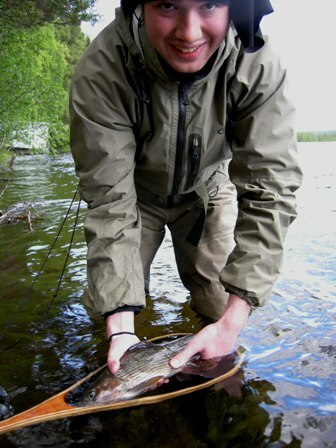 First of all, there were so many choices…swimming caddis, hatching yellow-May duns, egg-laying caddis, baetis duns floating, and baetis hatching. Bloop, Slurp, Burp. Son Peter was patient, confident in his mother’s ability to think like a hungry fish. I was more frustrated; LIKE, WHAT ARE THEY TAKING? I think they were taking it all, for what ever reason, randomly. BUT they were not really showing themselves. They were doing the bump. That thing where they push at the surface and swirl so sometimes you aren’t sure if it was a rising fish or an errant water current. Sometimes they rose enough to tail slap the water on their way back under. Soooo….what they wanted was not in the adult or dun stage. It was something emerging, or just before emerging, or on its way to emerge: baetis, caddis pupae, or yellow-May-dun nymph? I felt like that long ago mother trying to find out how to get my then two-year-old son to open his mouth and eat. So I searched through my fly-box cupboard. This was what I discovered: at first they liked the #14 parachute Adams, the #14 elk hair stimulator, and then they spit everything else out or completely refused. They didn’t want the Royal Wulff, or the weird fly (I have no idea where I got it or what it is called) that looked like a pupae with a feather tail, or the March Brown, or the Yellow-May-Dun imitation, or the Gold-Bead Pupae, or the Goddard Caddis, or the Grizzly Adams. Then I had to remind myself…”Self, didn’t we agree we should fish something just in or under the surface?” So I dug down in the fly box for a Klinkhammer. I found four. Three were black ribbed with silver tinsel…not exactly what I wanted, and the forth was a pupae style Klinkhammer that looked way too big. “Ok, we’ll try it.” WHAM. Son Peter and I cheered even though he only stuck the fish before it got away. He enthusiastically cast again. BINK he got another hit. BINK BINK. 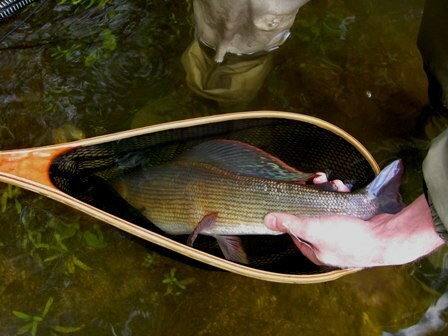 Finally Pete hooked and landed a nice grayling. YAY. The wind had blown all afternoon, a cold wind. The water was also cold from the recent rains and had numbed our feet. We had been fishing four hours without a break. So we went to eat lunch on the bank. The sun came out for just a moment and the caddis flew in dizzying circles around our heads. About three feet in front of us a fish rose, then another. For some time we just watched and listened to the fish sporatically rising… Slurp, Burp. Then I just had to see if I could do something about one of those rising fish. Dink, dink. I barely cast the line off the bank, which made me feel sort of disrespectful, like I wasn’t really being serious…then WHAM. “Peter, I need my vest, or you put the vest on, at least get the net off the back of the vest I have to follow this fish.” Off we went for a fish rodeo. We got it netted and what a fish! I caught it, and Peter posed with it. 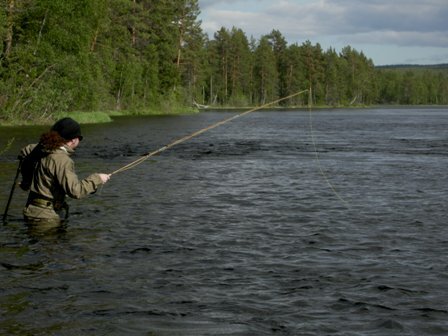 We agreed that tomorrow instead of making ourselves crazy casting everything in the fly box, we should just go sit on the bank and dink around. Wonderful story and a beautiful fish. Sounds like you are having a great visit.